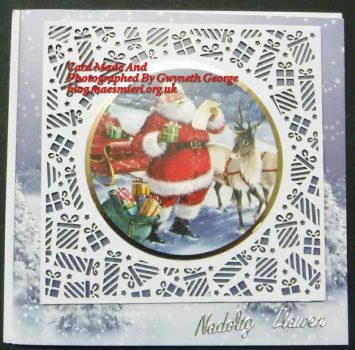 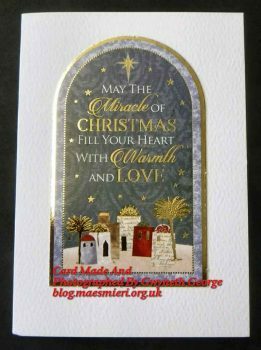 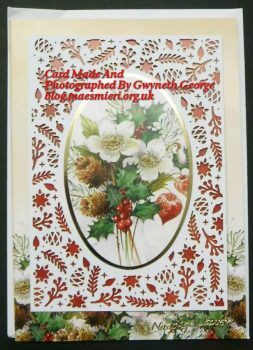 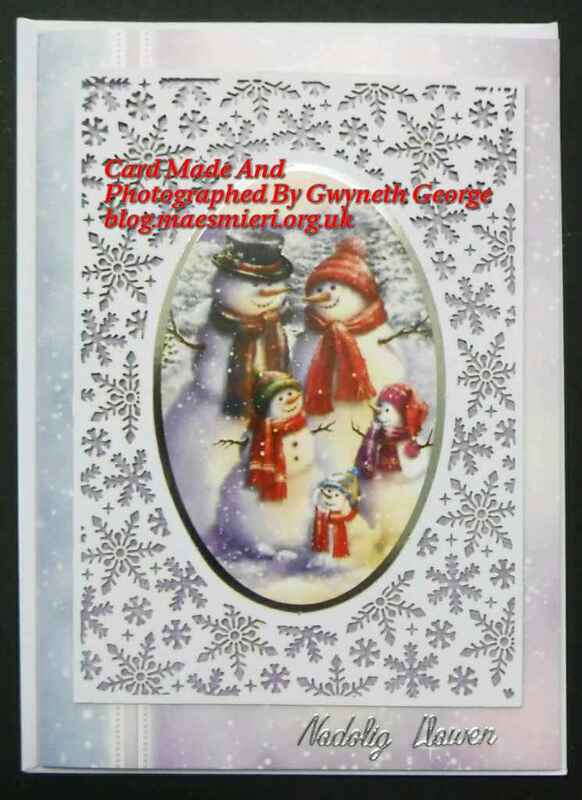 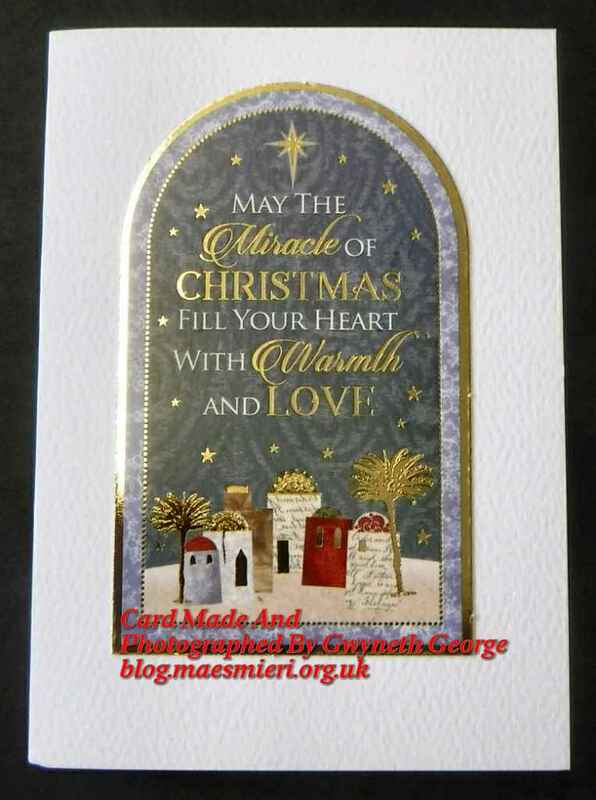 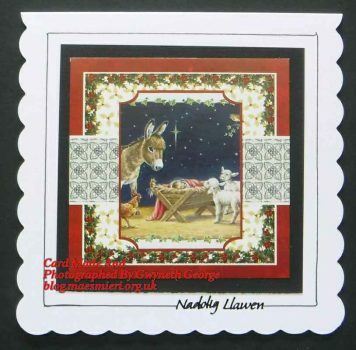 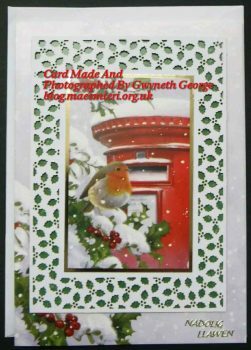 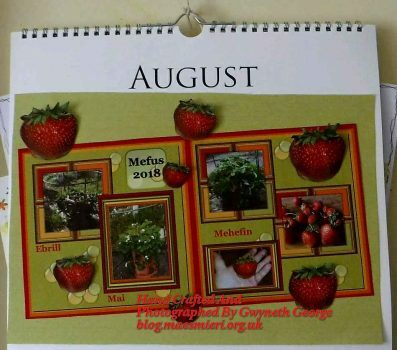 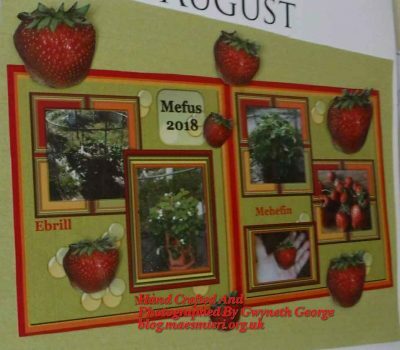 I’ve set myself a bit of a challenge to make as many batches of Christmas cards as I can during the rest of August so that I can then put my box of Christmas card consumables back in the garage for a bit and get my quilting back out to work on that in September. 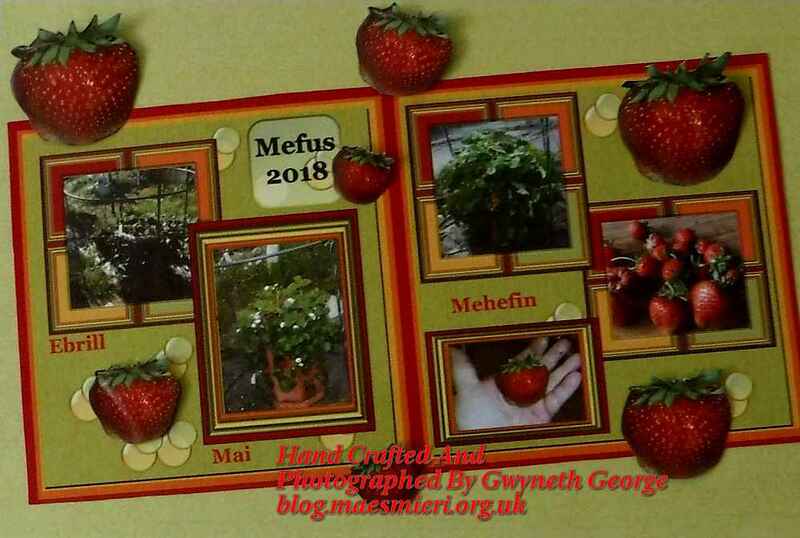 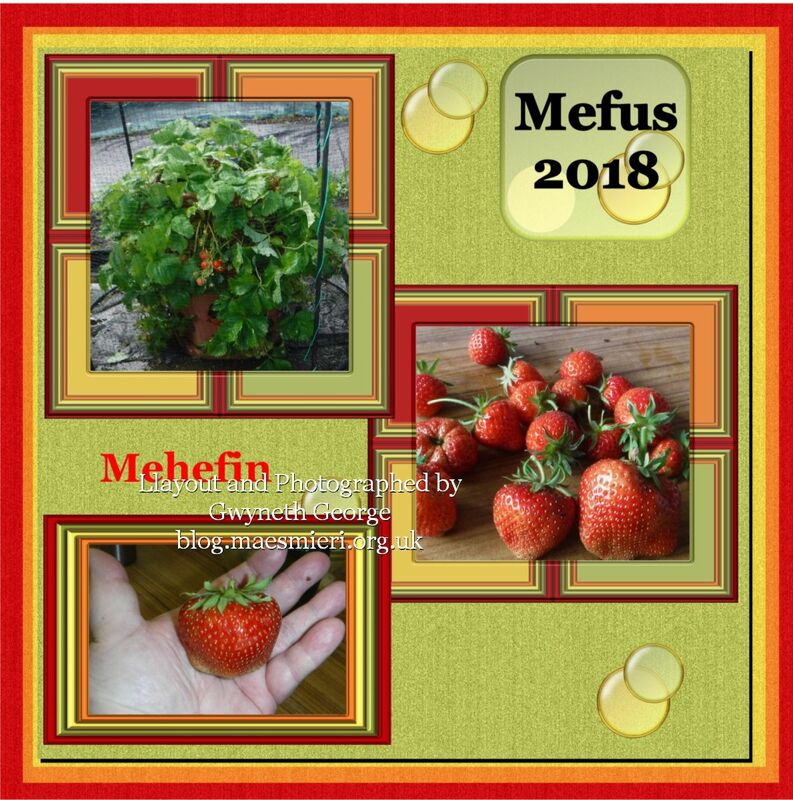 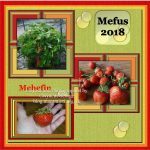 I’m not saying that I’ll have made all I need for the year, but I’ll have a fair few to start off with, and can get stuff back out the end of October/November if I’ve had a lot of sales and need to make more for Mam and I to send ourselves. 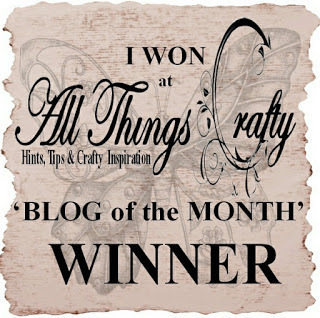 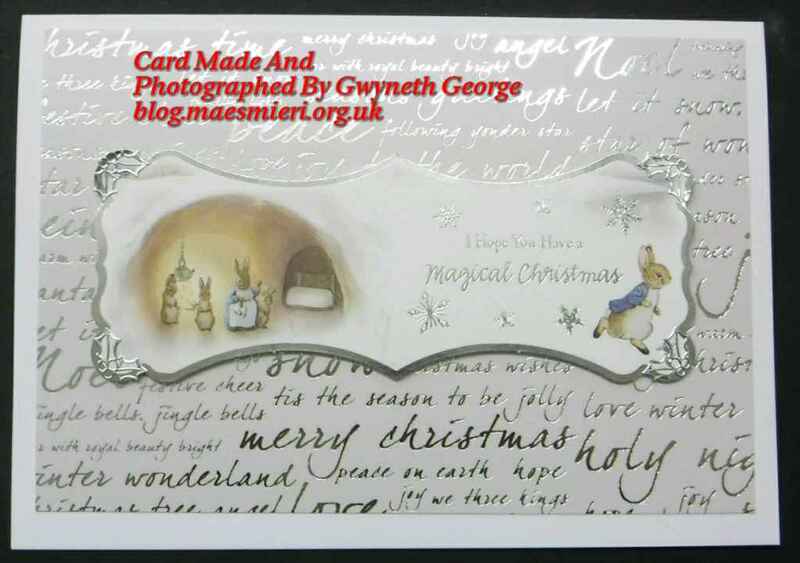 If I get what I want made up I’ll probably have Christmas card blog posts to show you well into September. 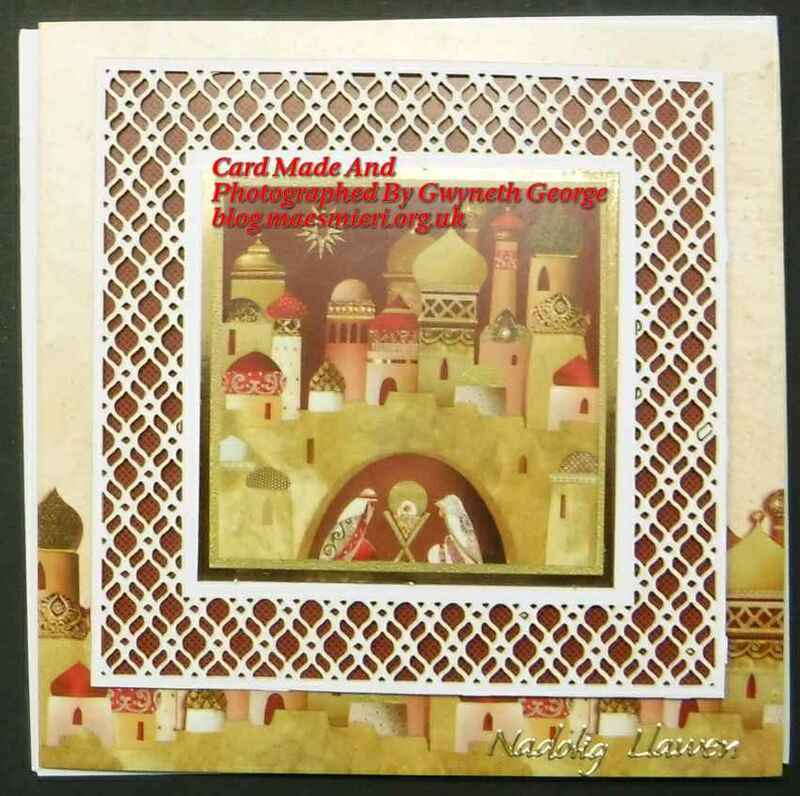 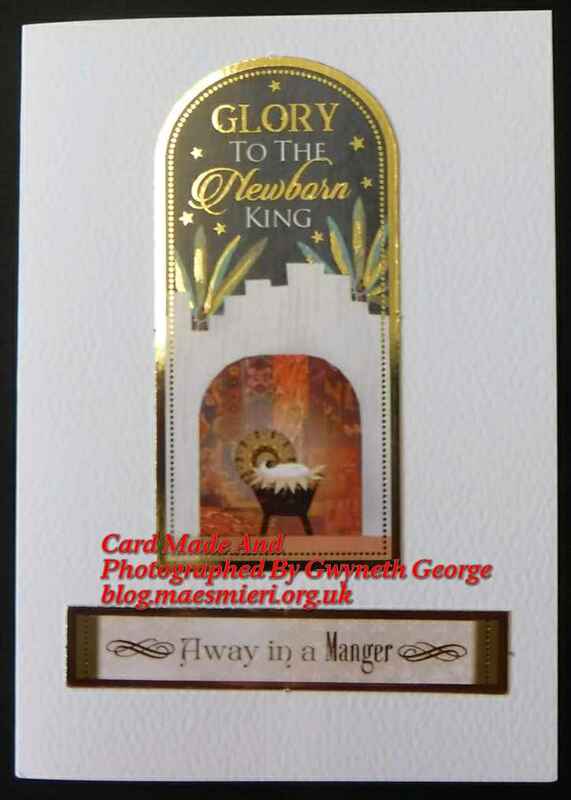 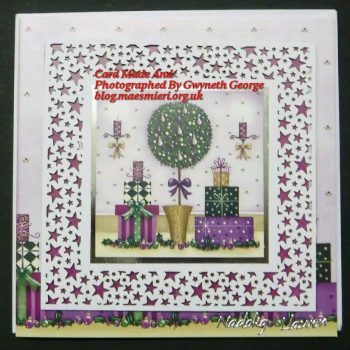 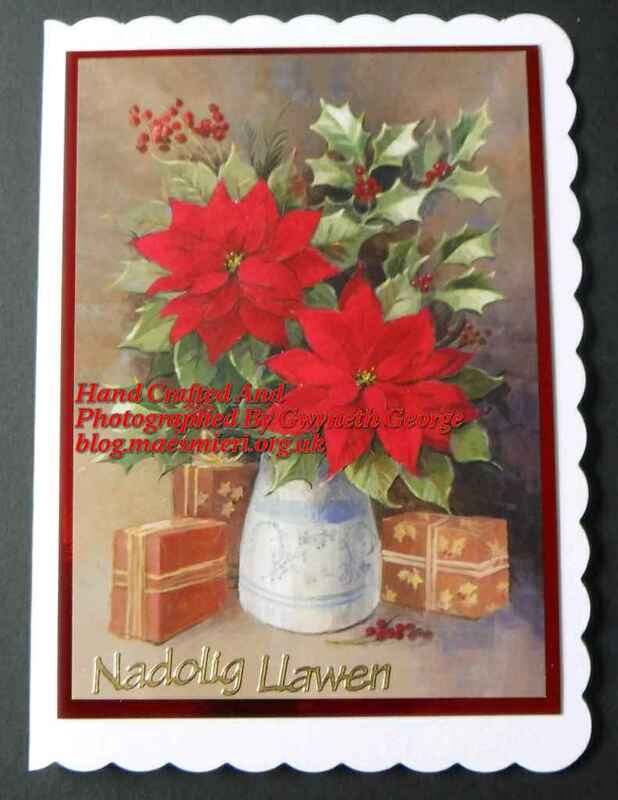 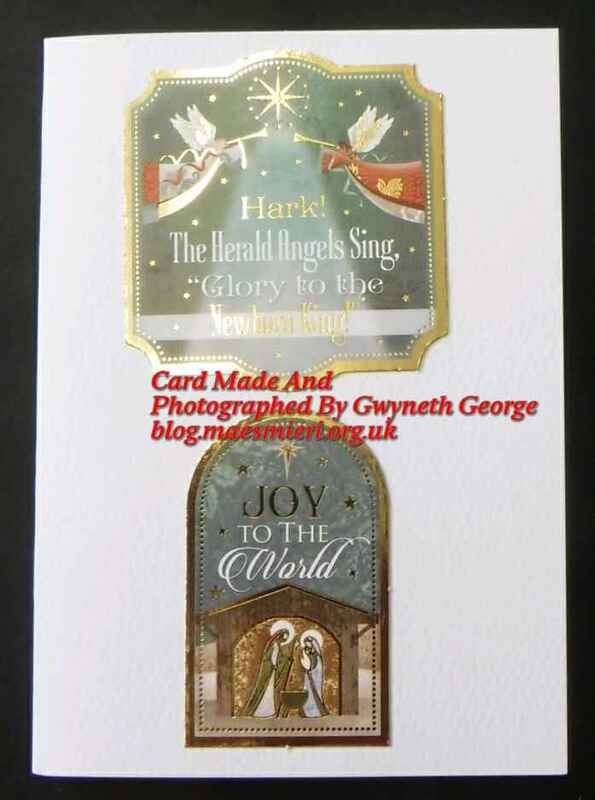 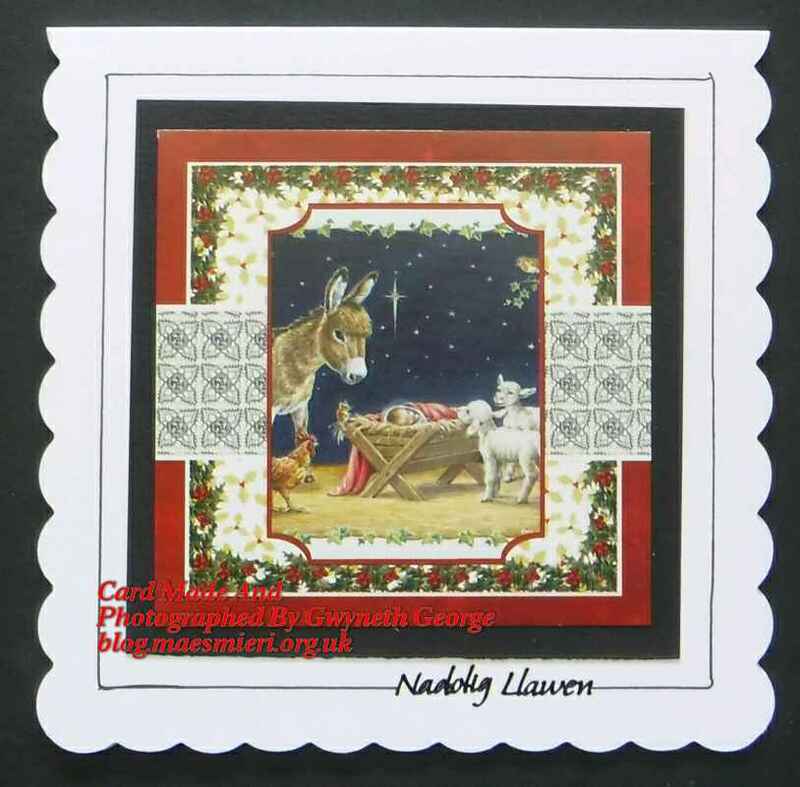 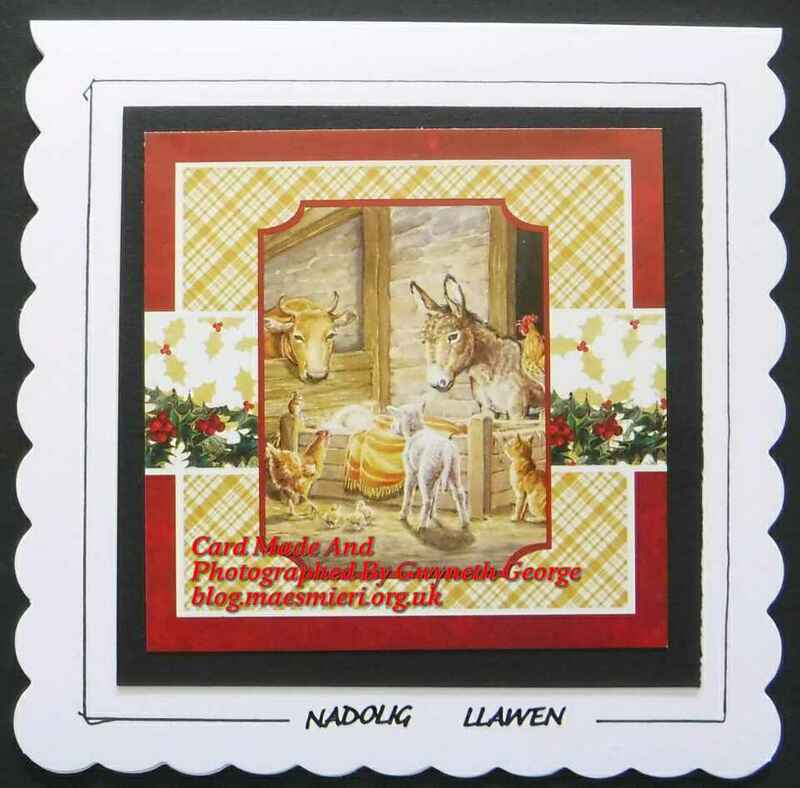 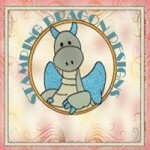 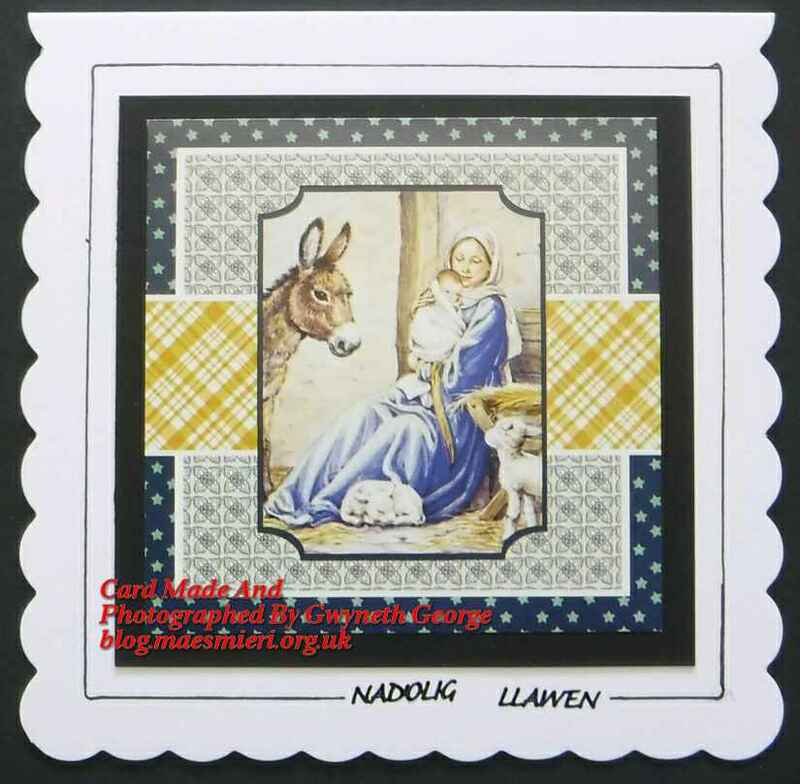 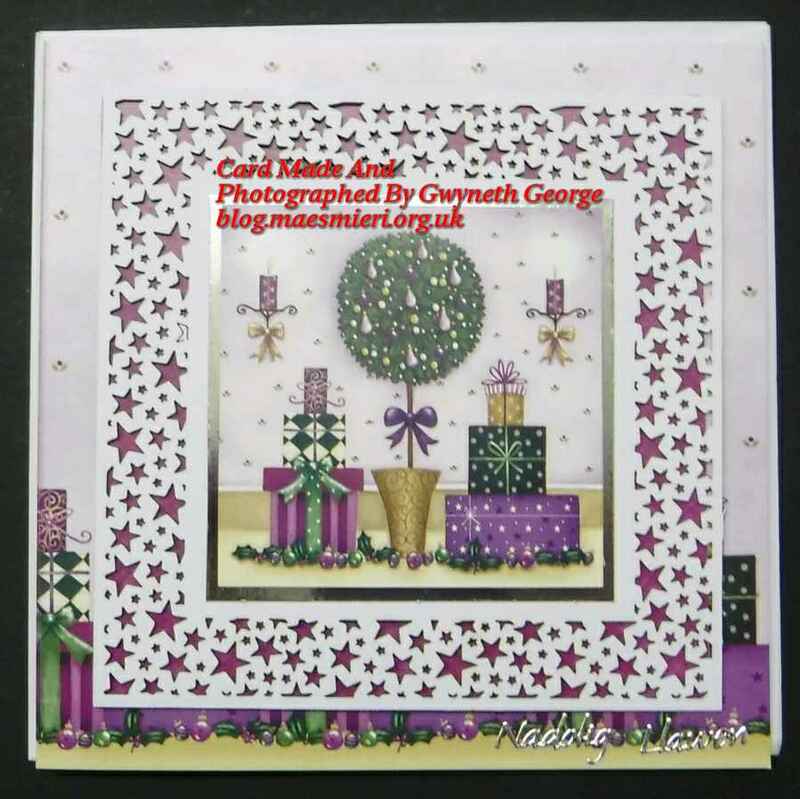 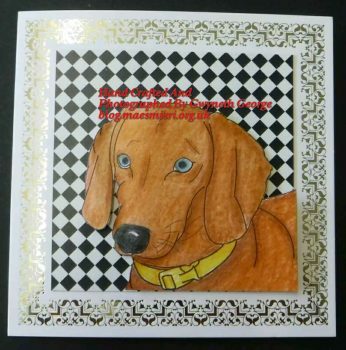 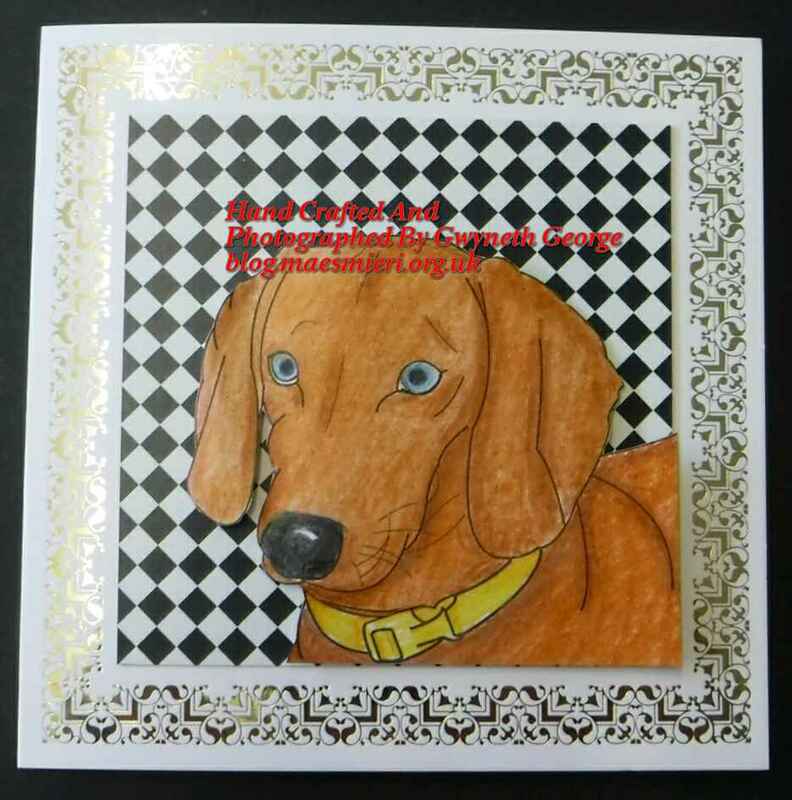 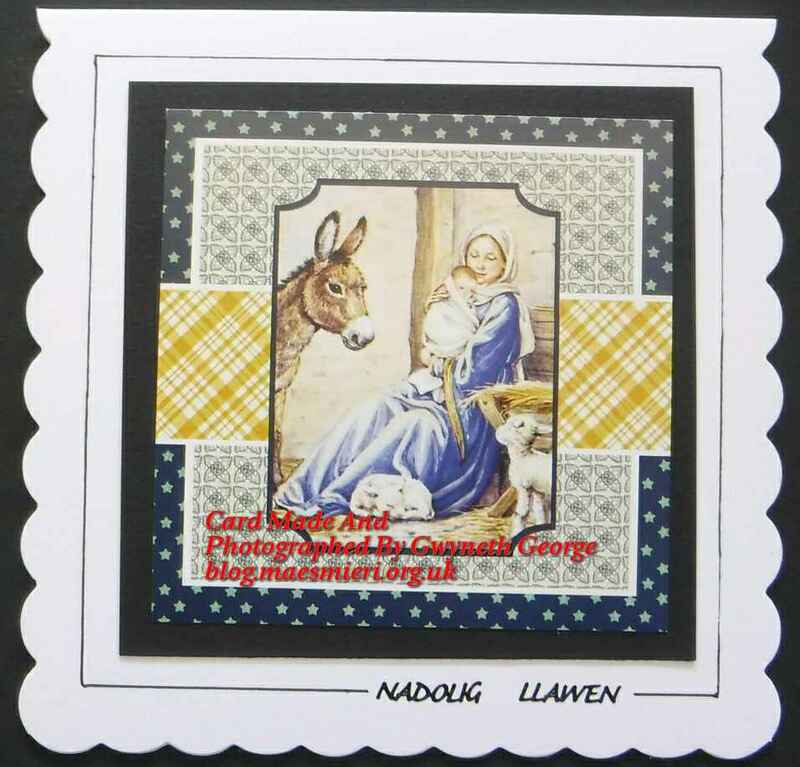 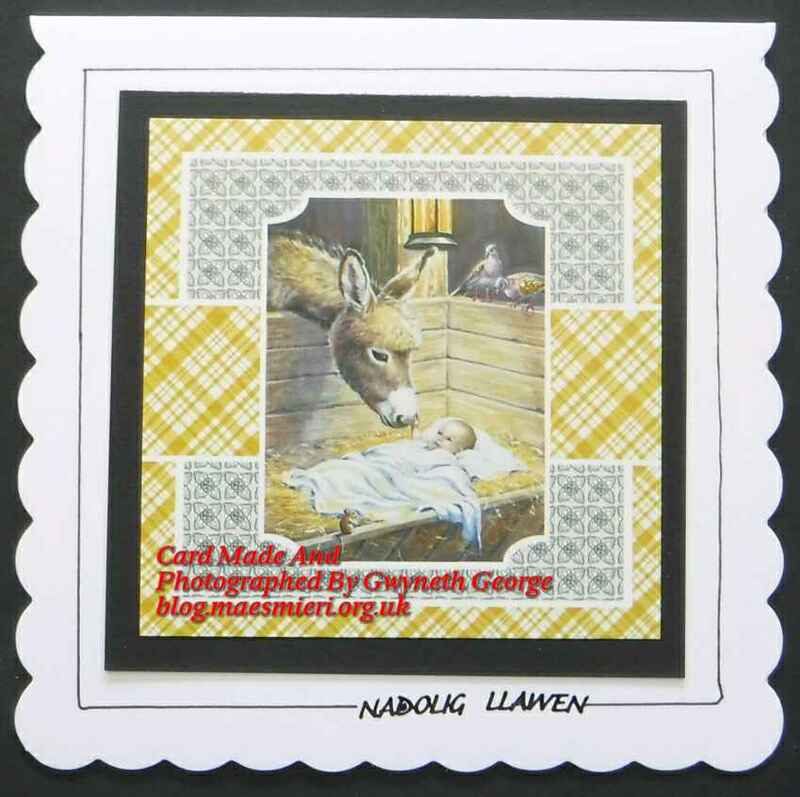 For the cards I’m going to show you today I used different inserts from this year’s Hunkydory collection. I also made my own foiled greetings on parchment. 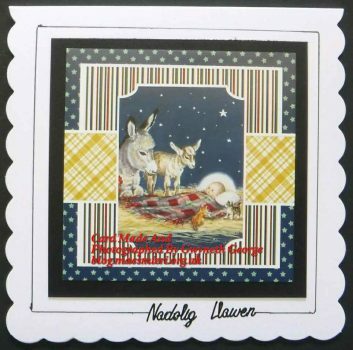 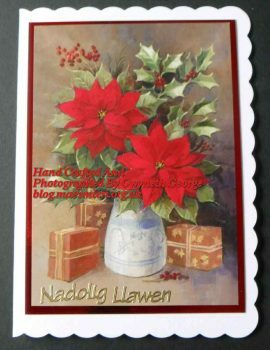 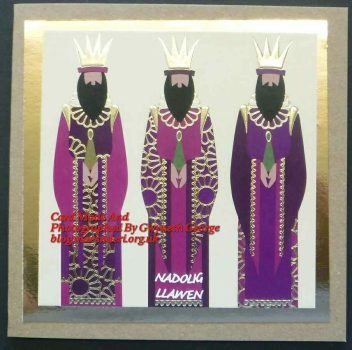 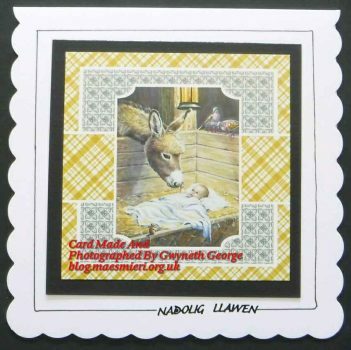 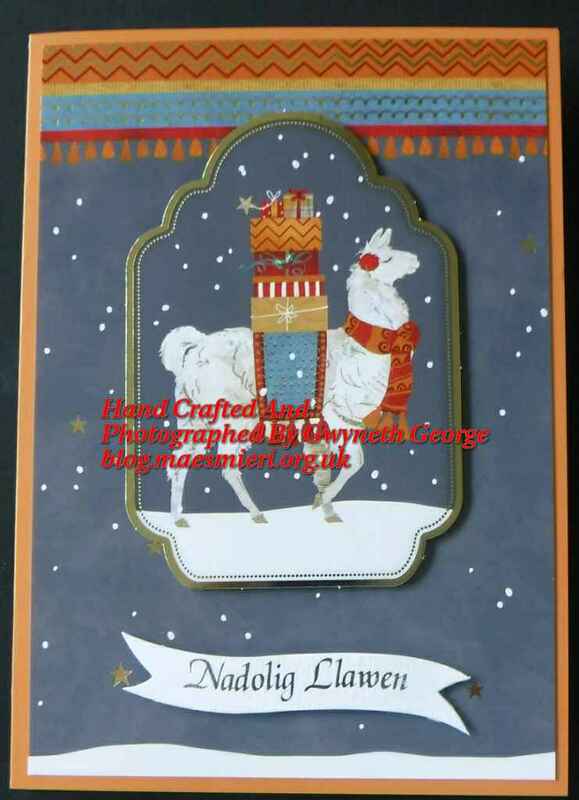 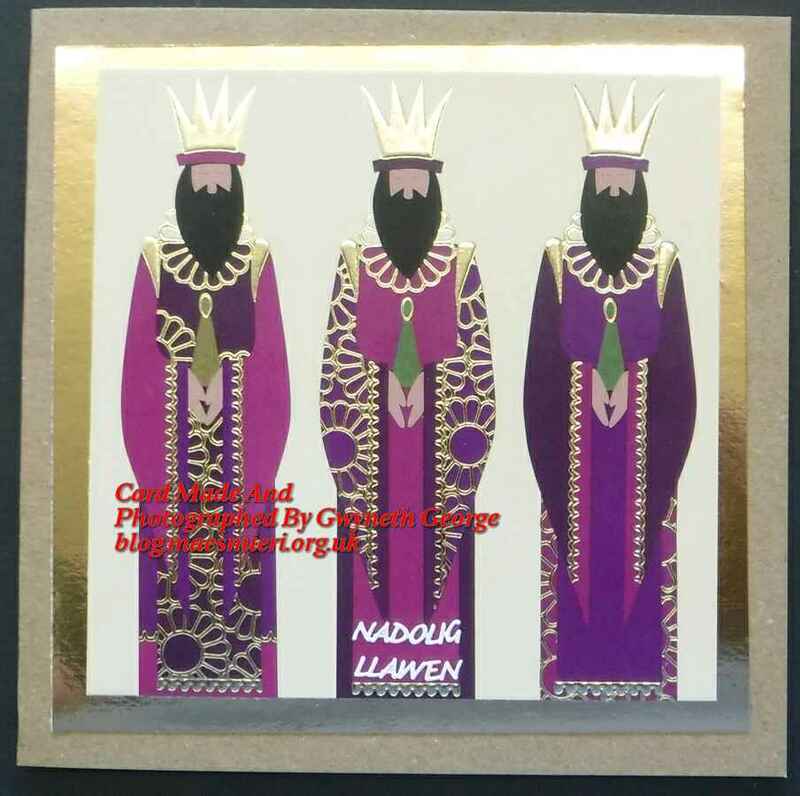 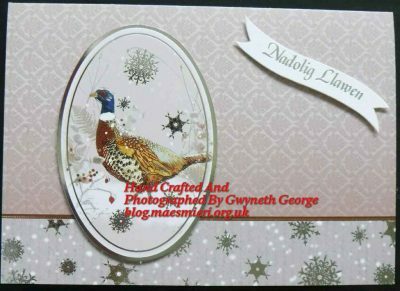 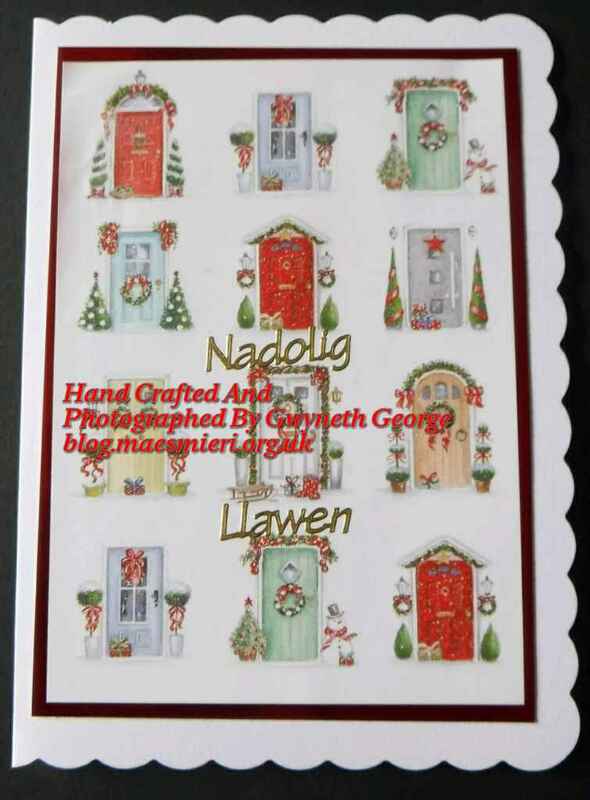 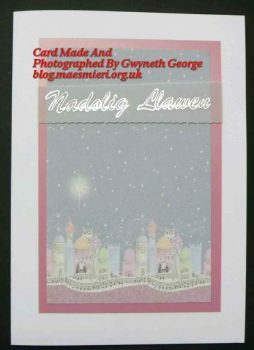 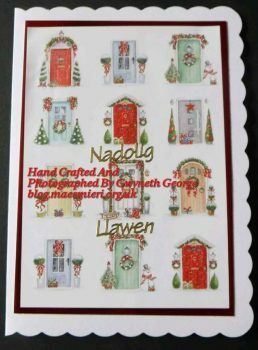 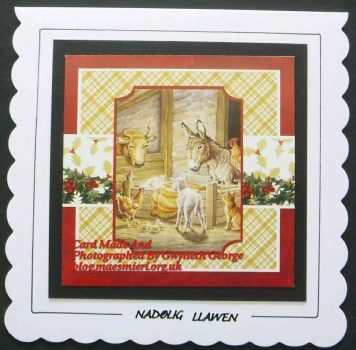 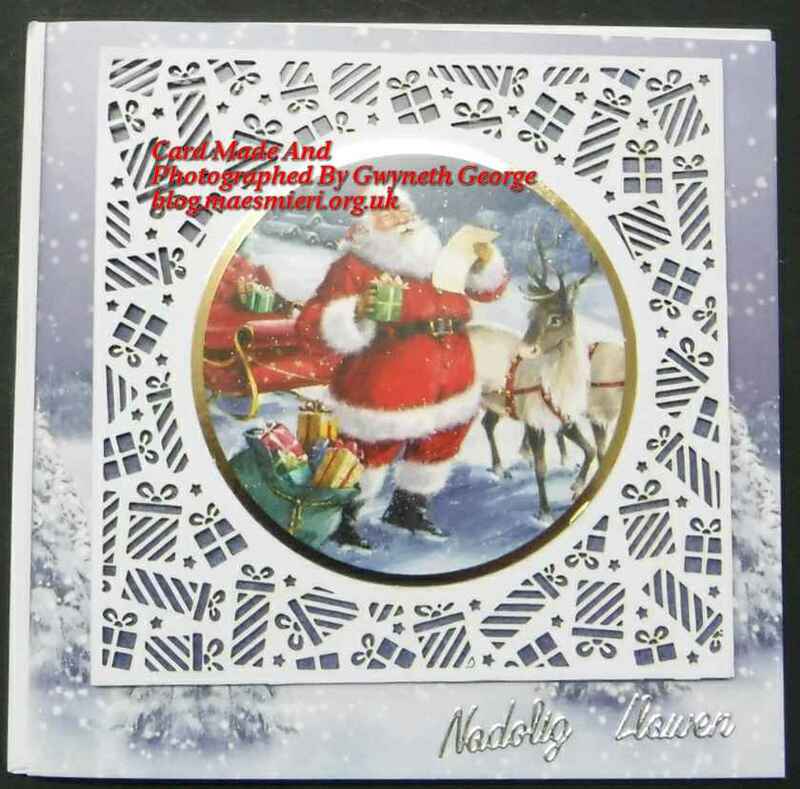 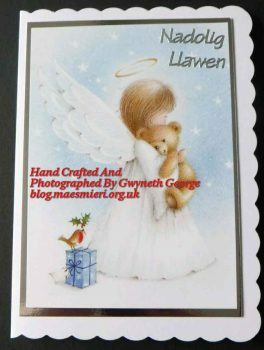 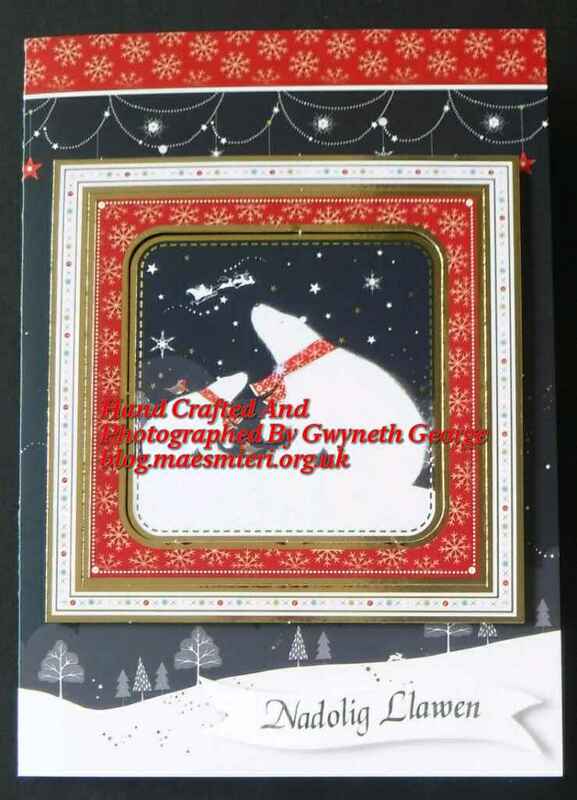 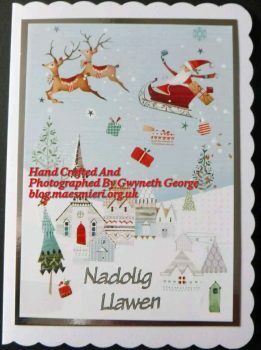 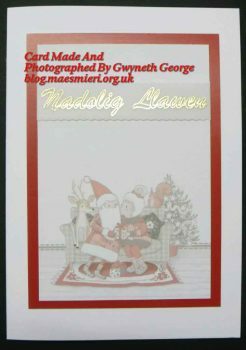 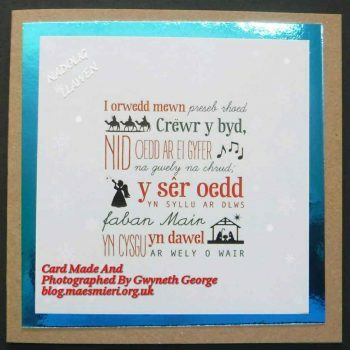 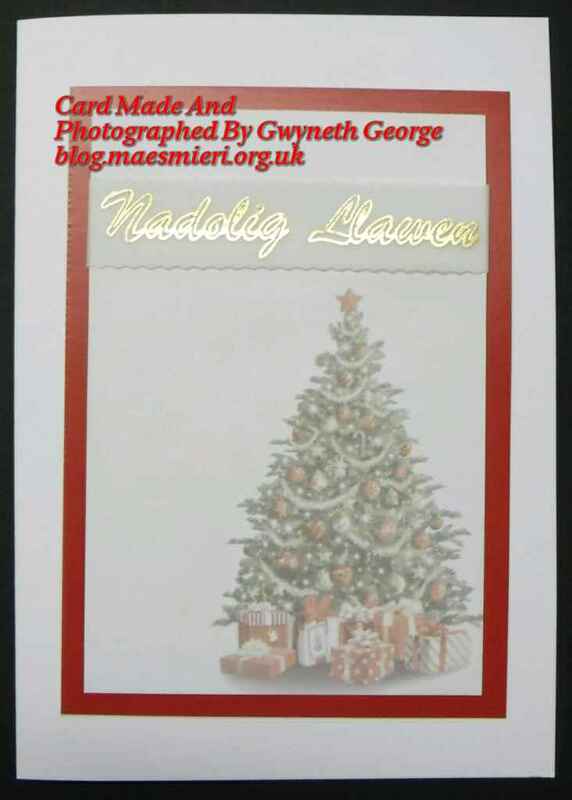 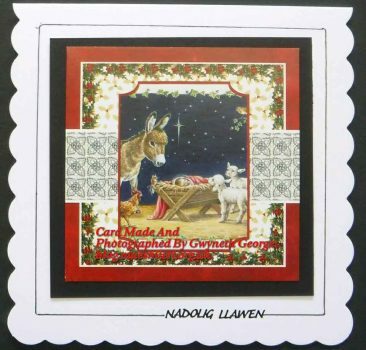 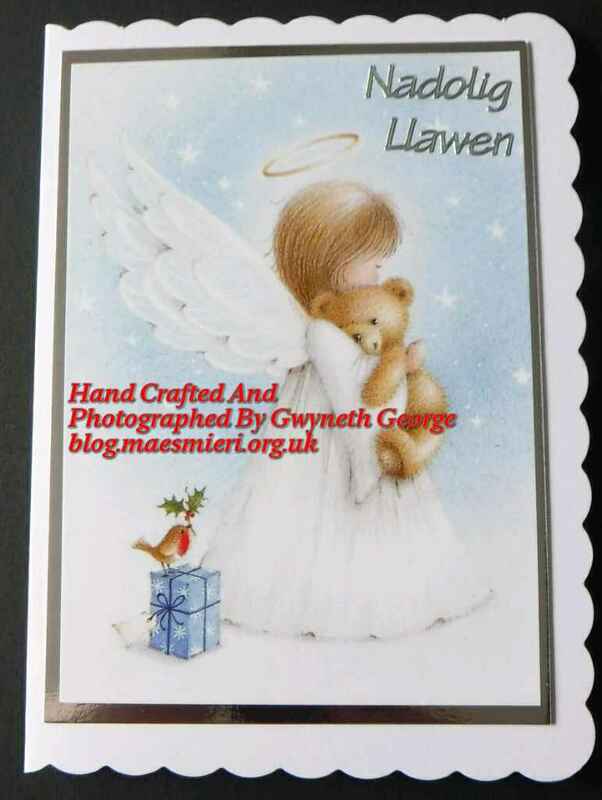 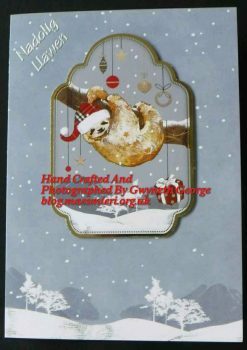 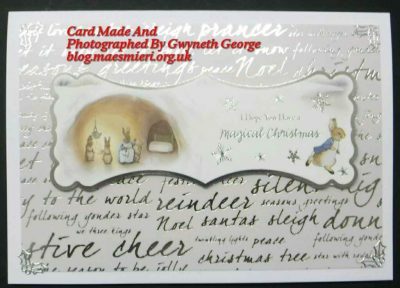 I started by using the downloaded Canvas software to design the words Nadolig Llawen (Welsh for Happy Christmas) ar around 4″ in length. 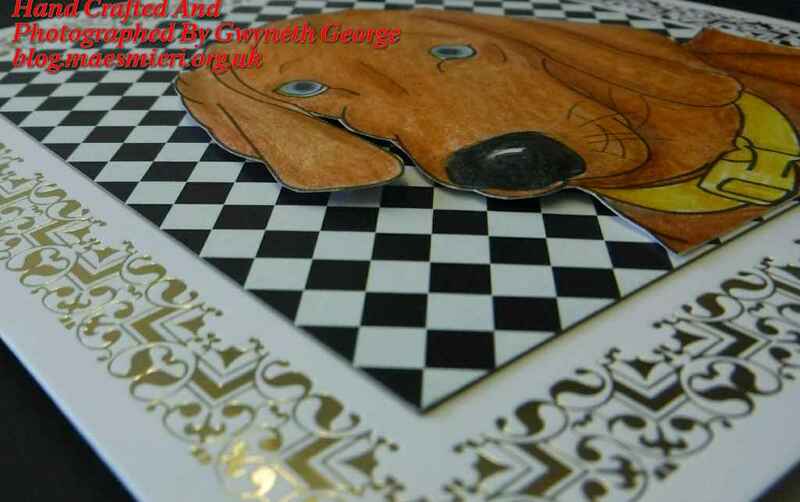 These I sent to my ScanNCut and used the foiling feature to write the words with a glue pen onto Parchment paper. 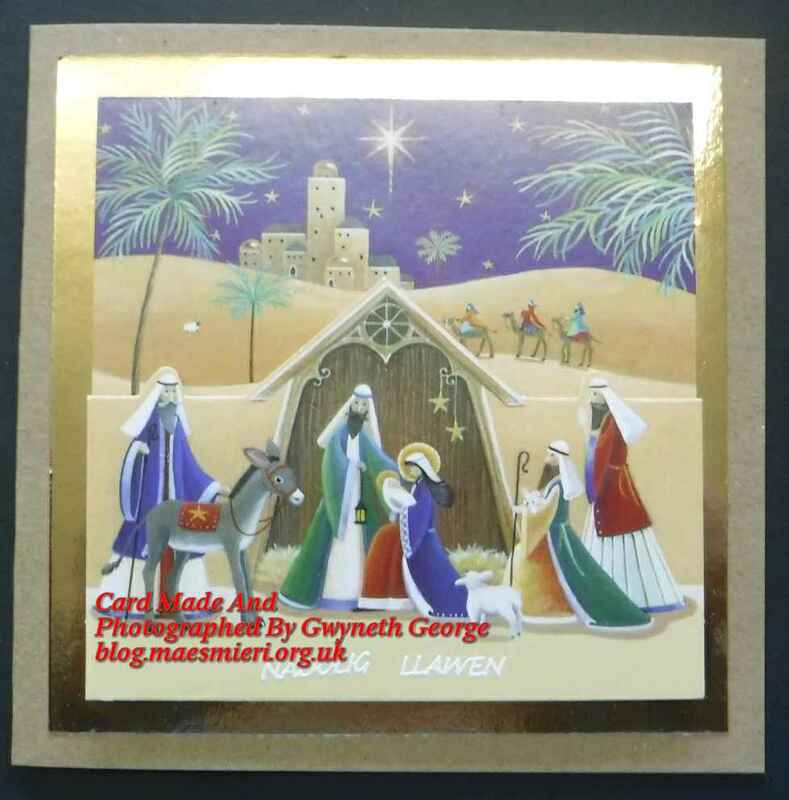 These were then covered with foil, some silver and some gold, before beeing rubbed and the foil sheet removed. 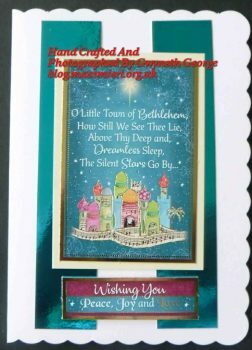 The greetings were then cut out in strips. 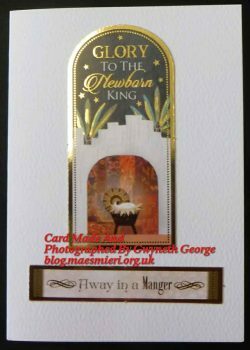 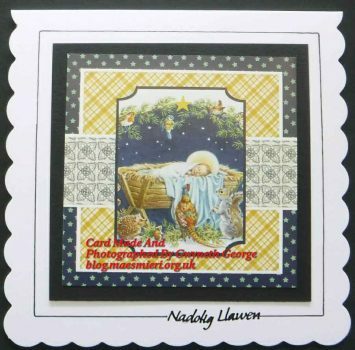 I took the bundle of inserts from this year’s Hunkeydory Christmas selection and chose some with an image forming part of the sheet. 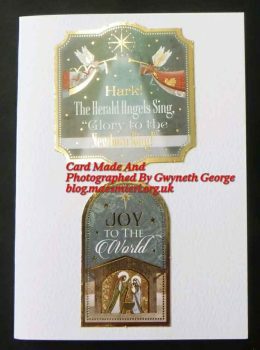 I cut an image panel of 4.25″ x 6.25″ from each insert before trimming a quarter inch from the height of the piece that was left. 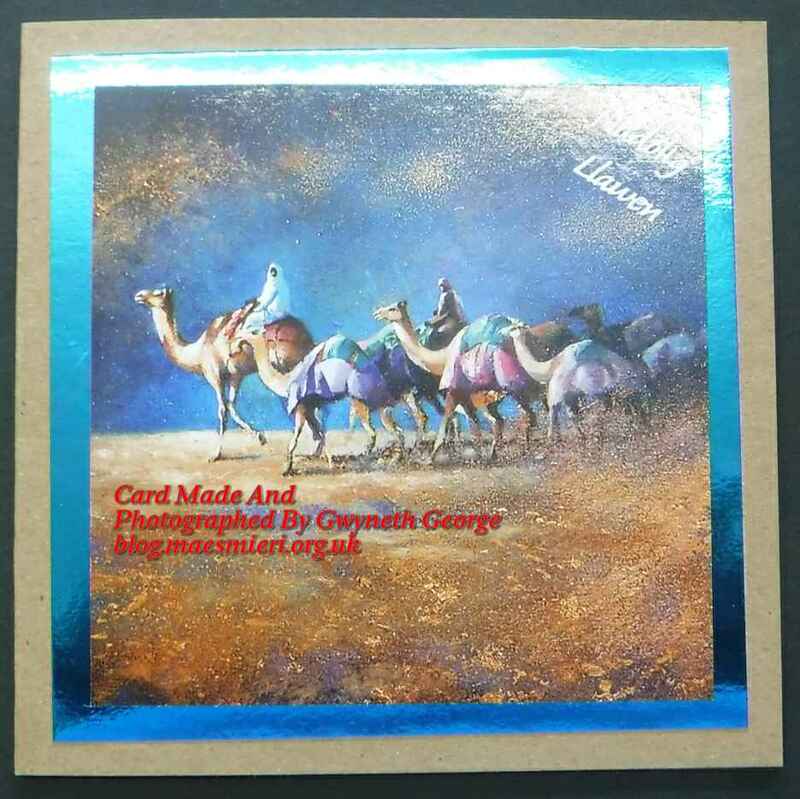 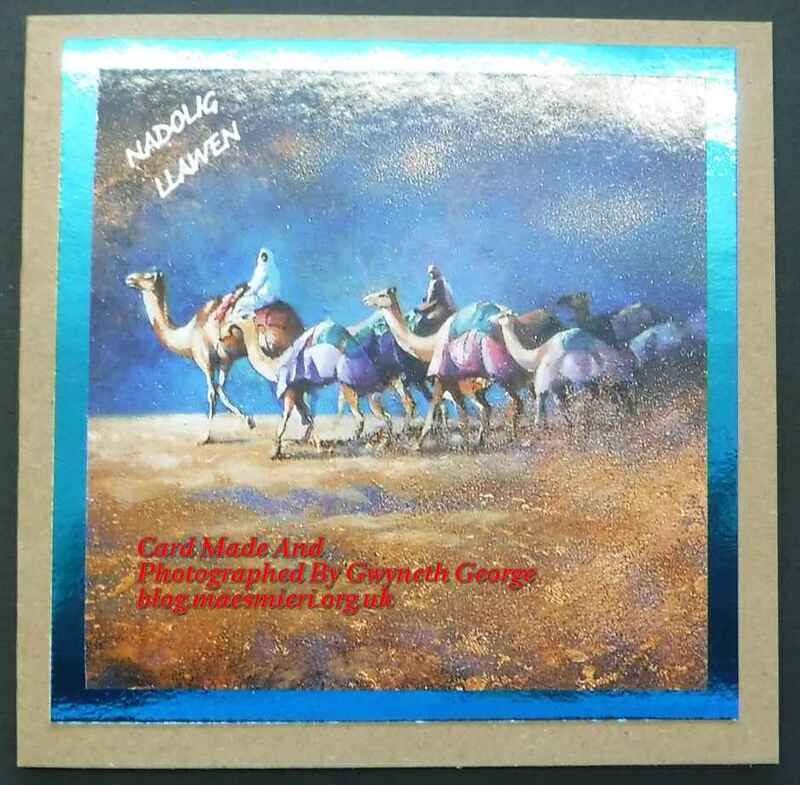 I cut various coloured and foil panels of 4.75″ x 6.75″ to use as mats for my images. Before sticking the images to the mats I wrapped parchment greeting strips around each image, using tape at the back to keep it in place. 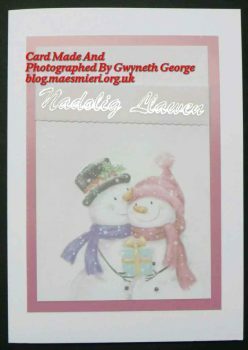 Double sided, fingerlift tape was used to attach image to mat, and then the matted image to a plain white, pre scored, A5 base card. 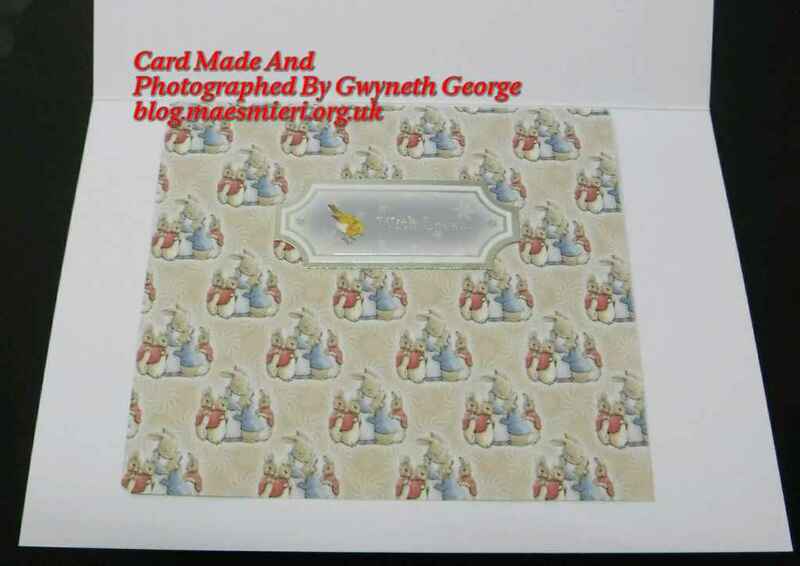 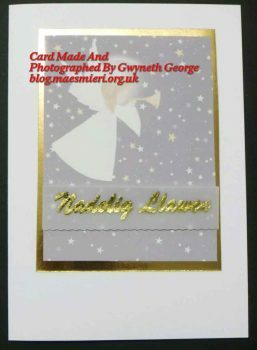 I then used the same tape to attached the left over bit of matching insert, gaving folded down a bit, inside each card. 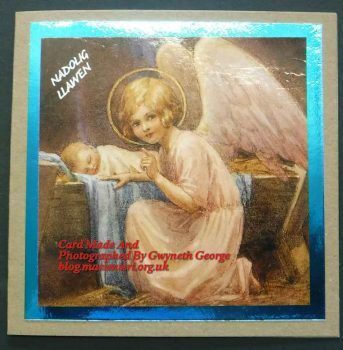 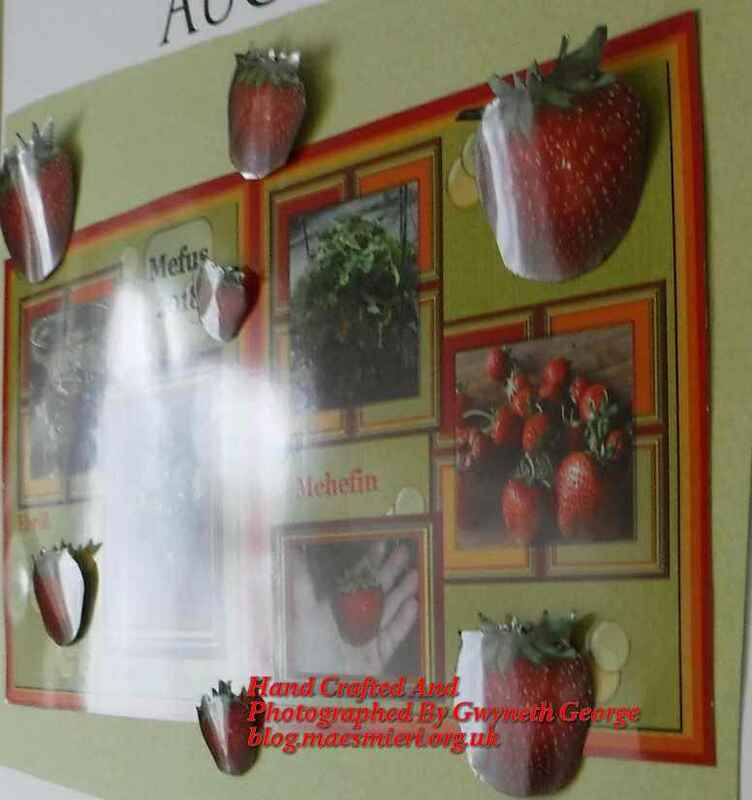 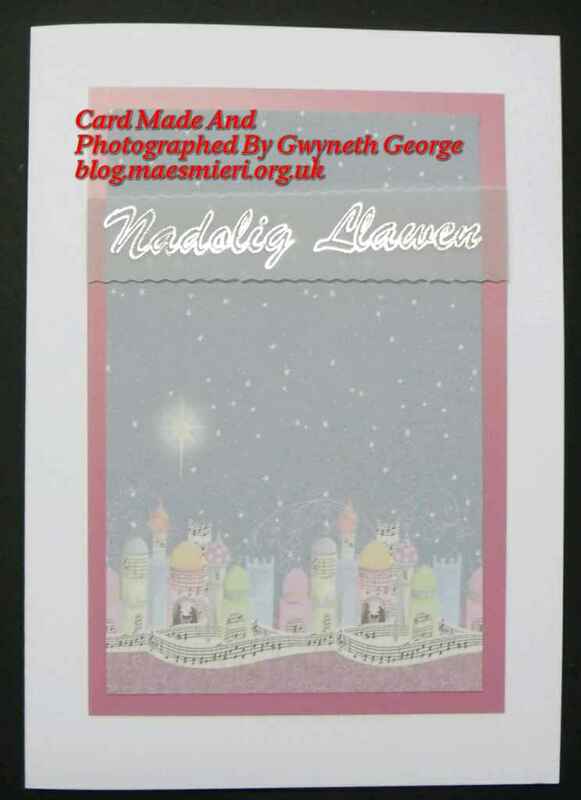 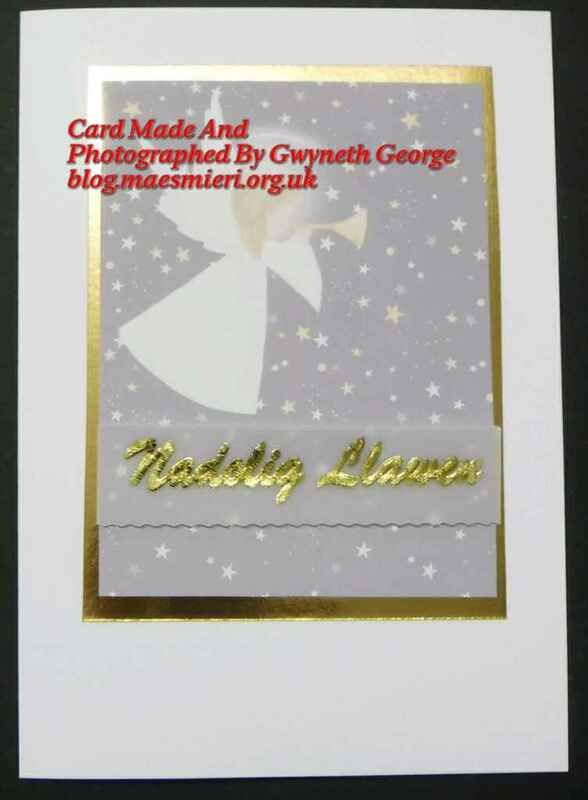 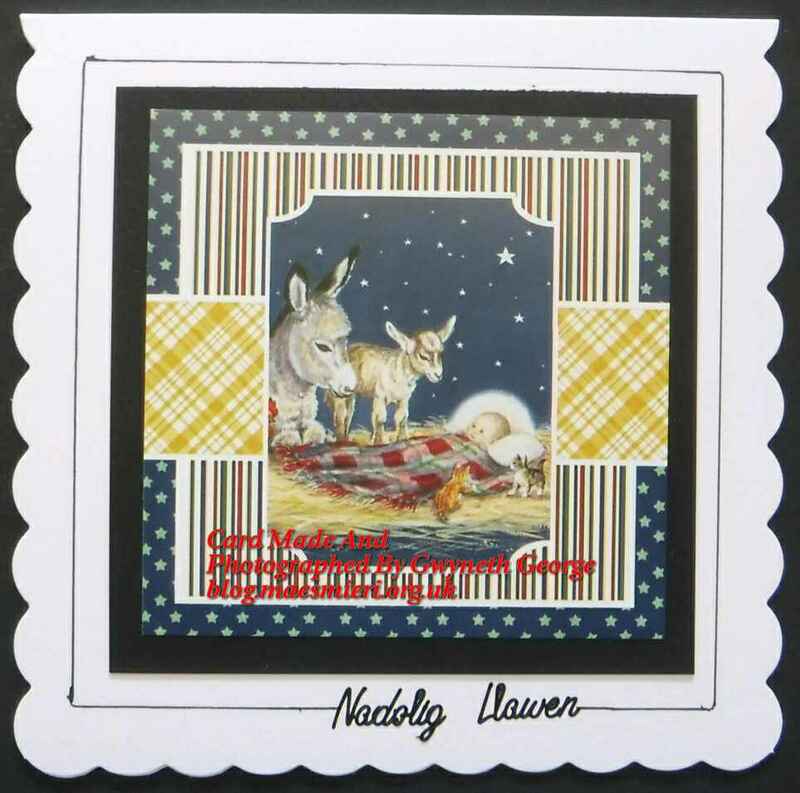 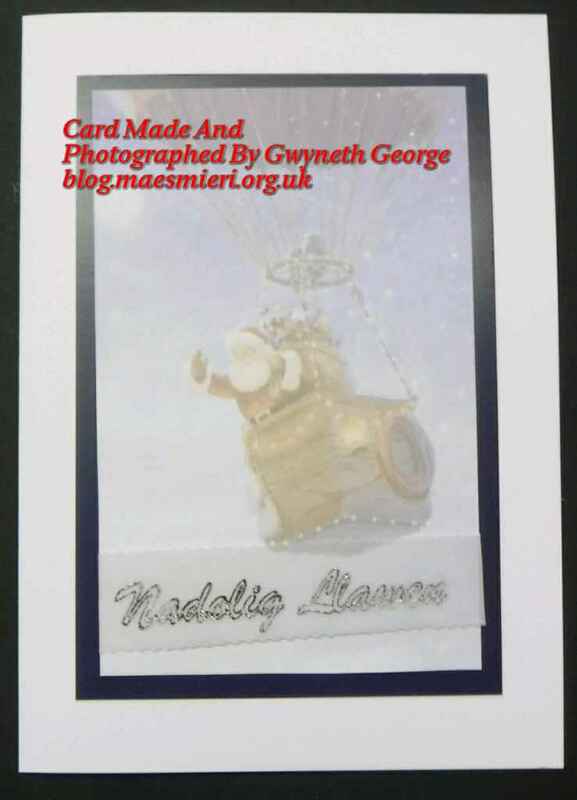 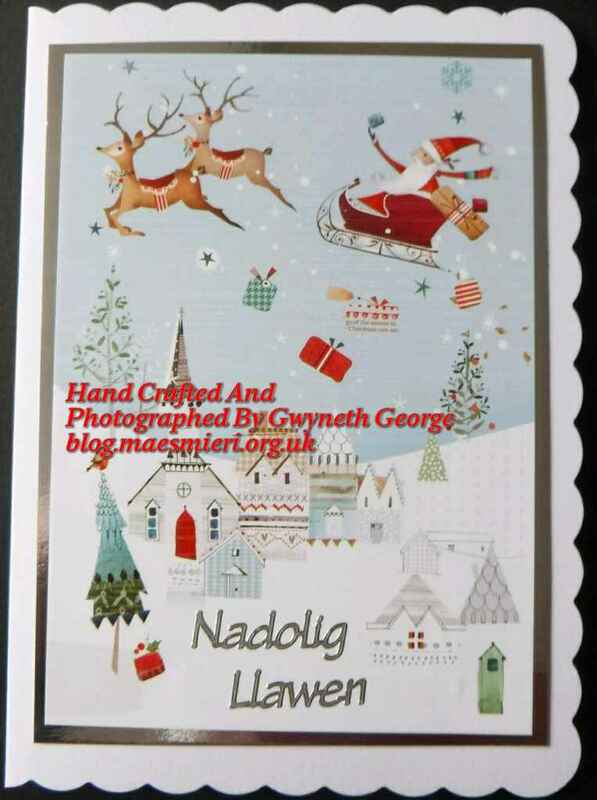 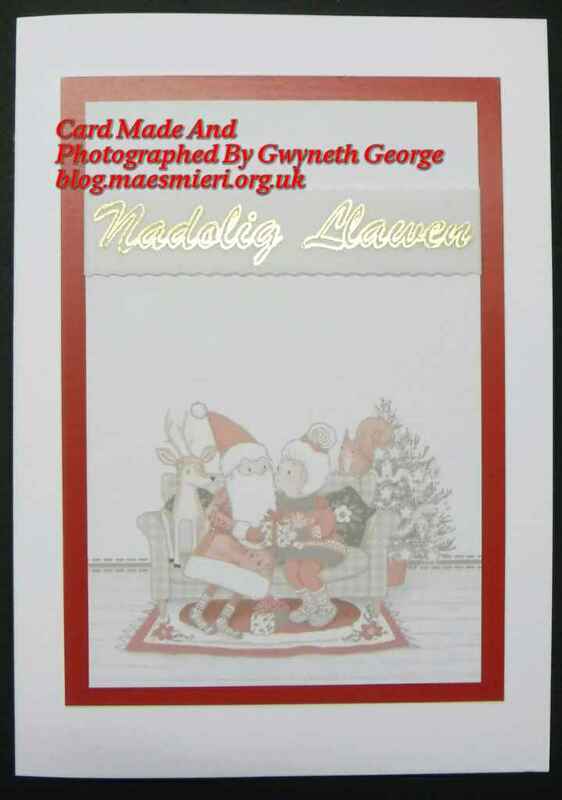 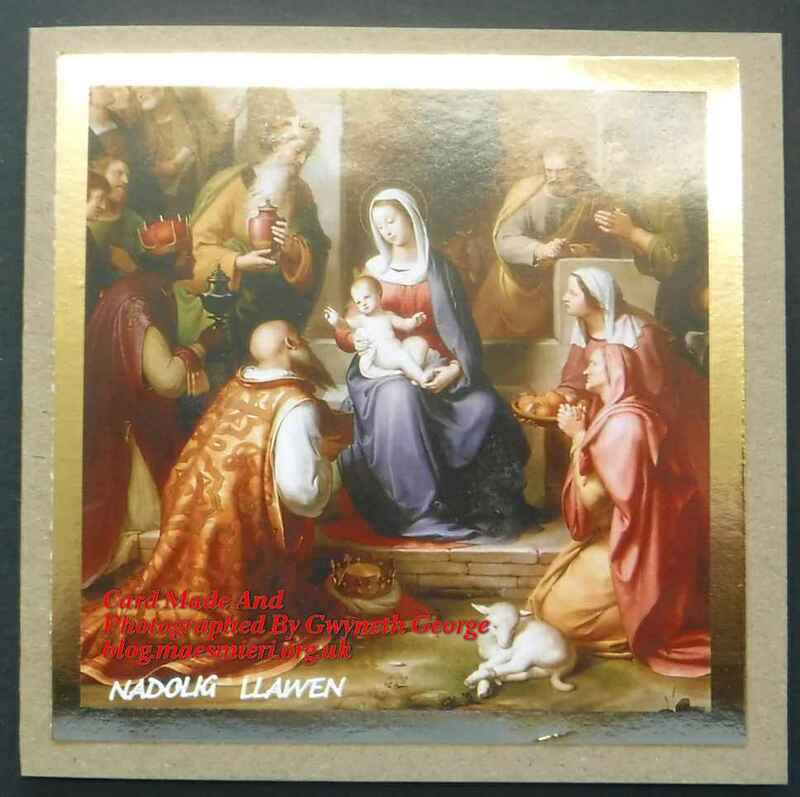 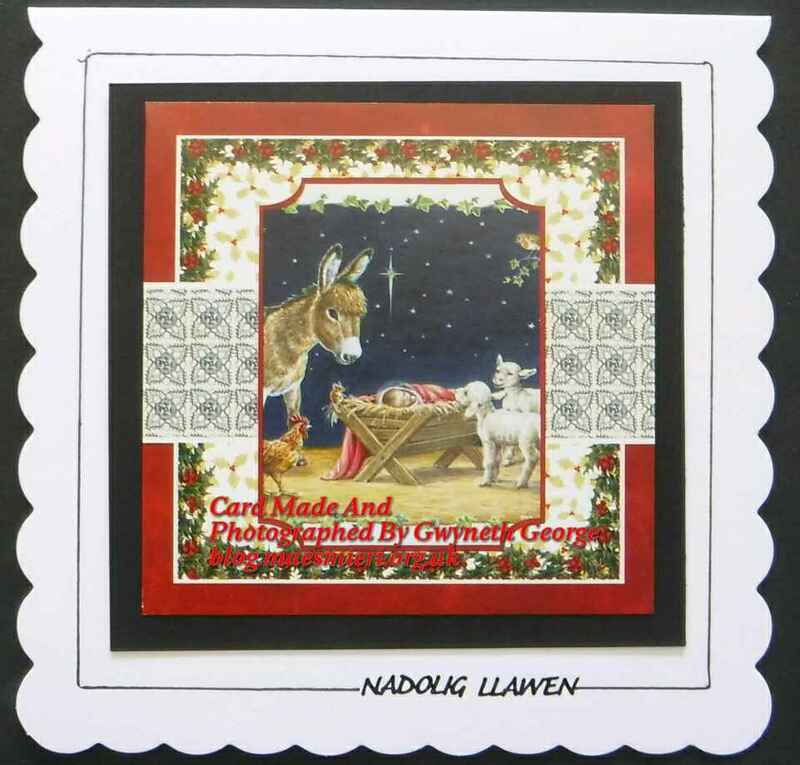 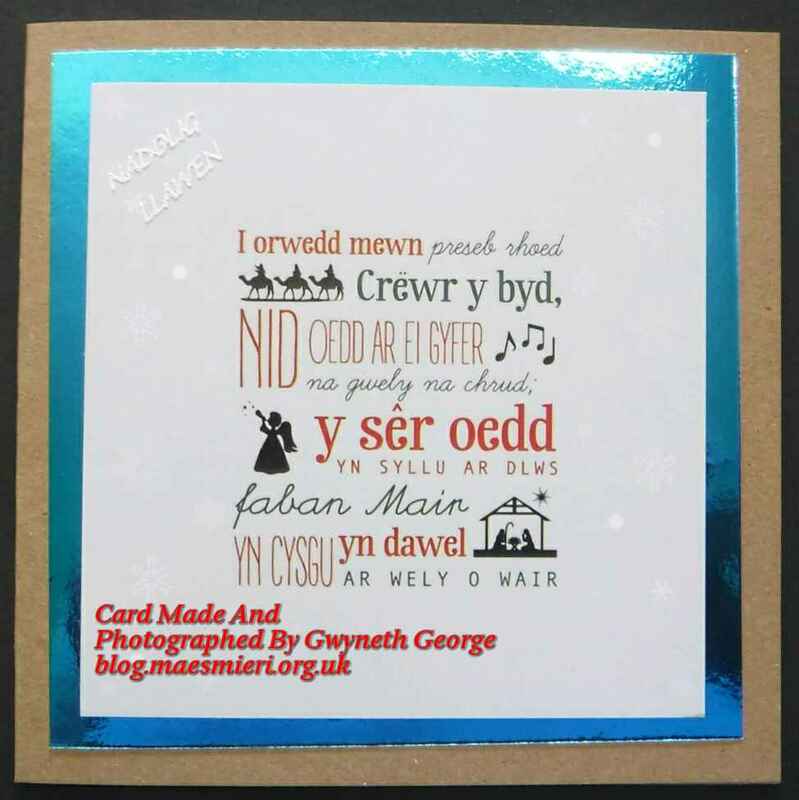 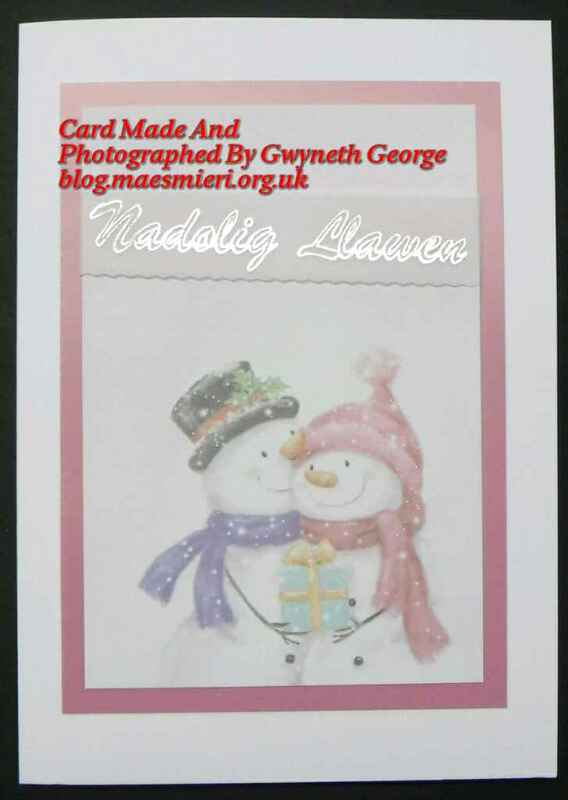 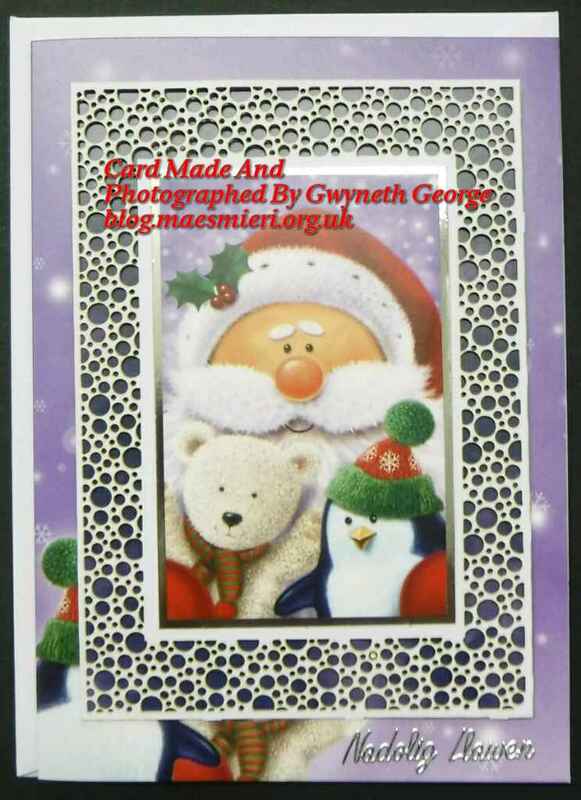 I added peeloffs saying Nadolig Llawen to the inserts. 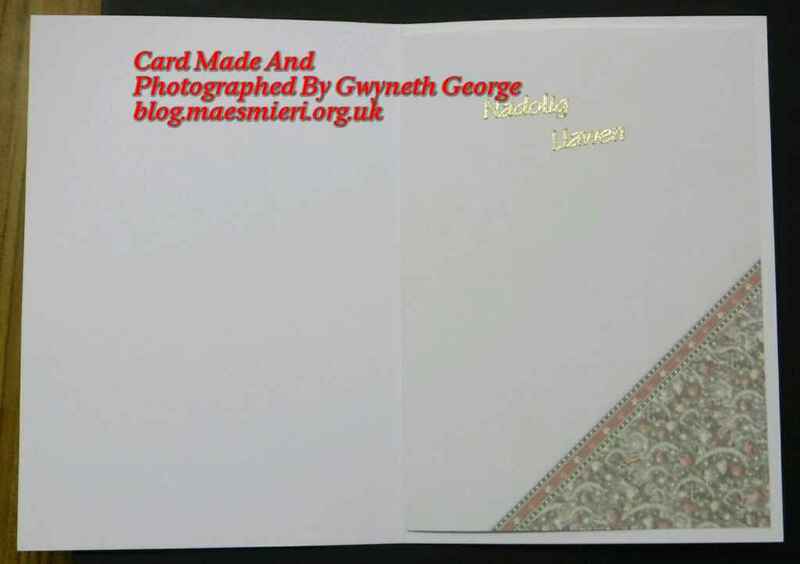 Here are the cards I created, together with the inserts of the first two, to give you an idea of what I did. 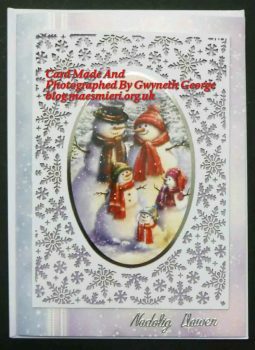 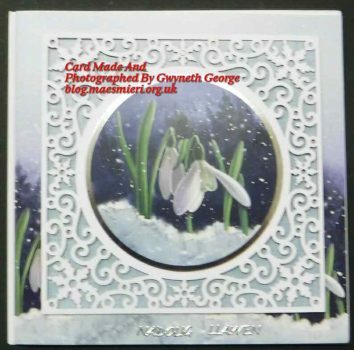 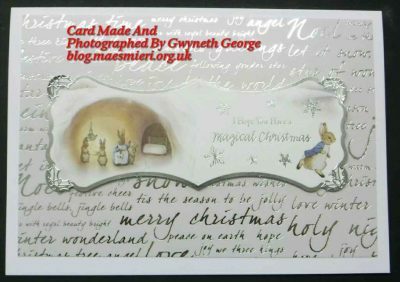 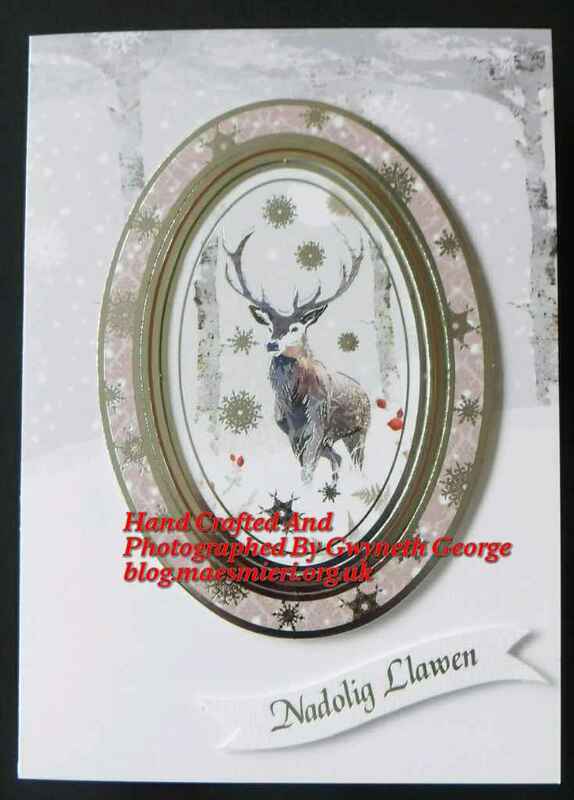 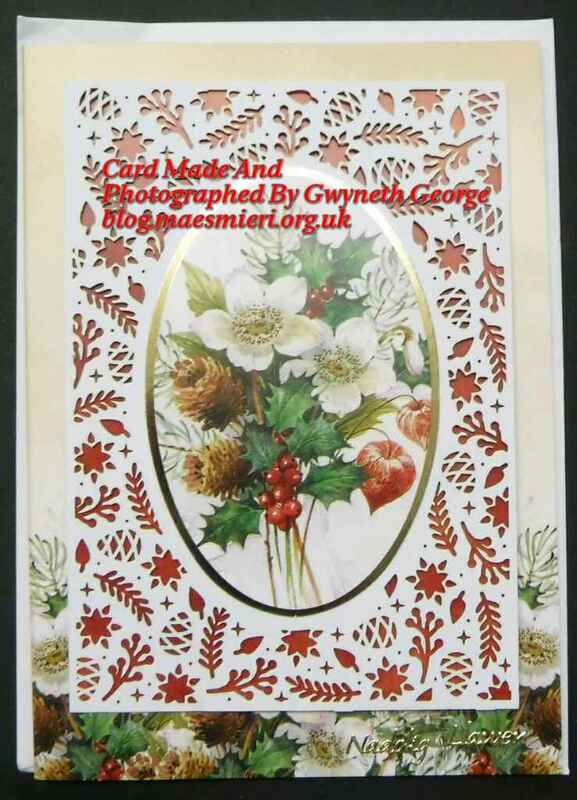 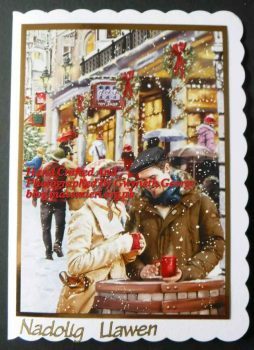 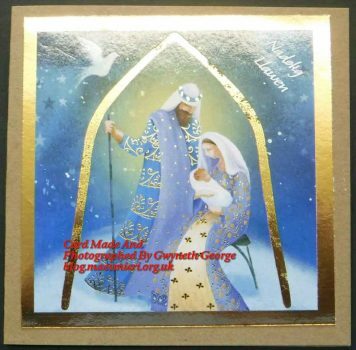 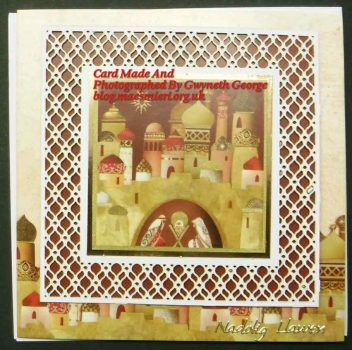 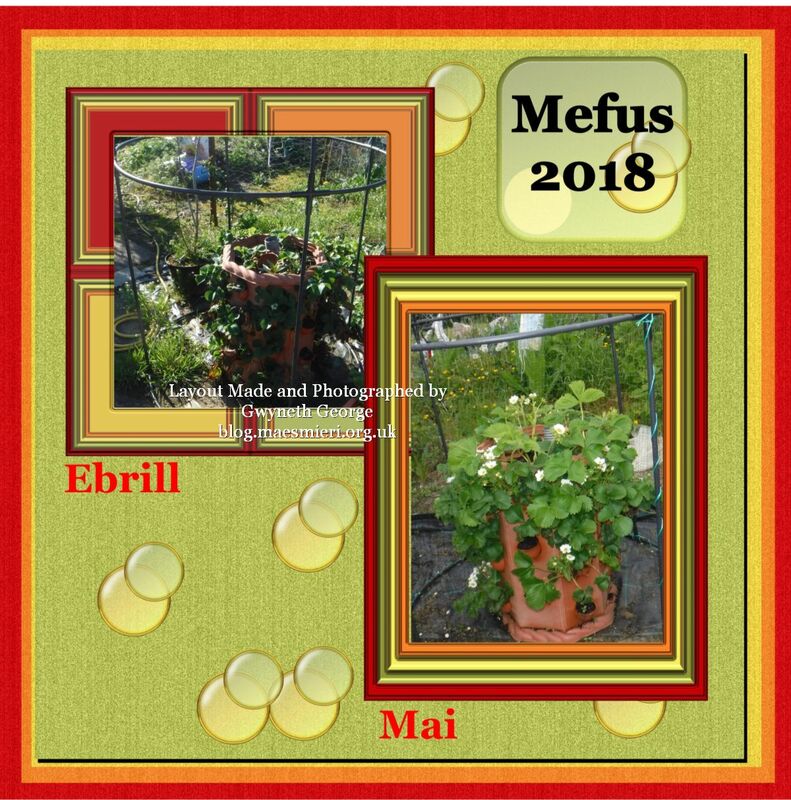 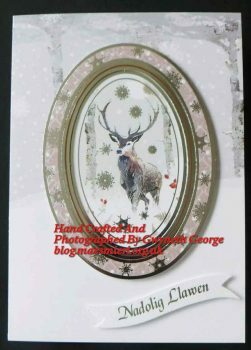 As you can see, the cards have a much softer look than the ones made using the same image toppers from the collection, but those who’ve seen them here have commented that they like the effect as it is so different to anything in the shops. 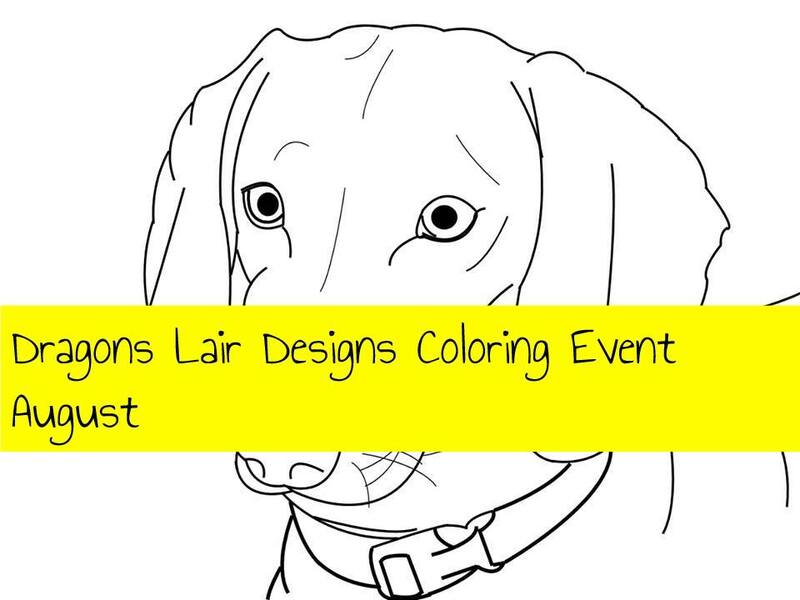 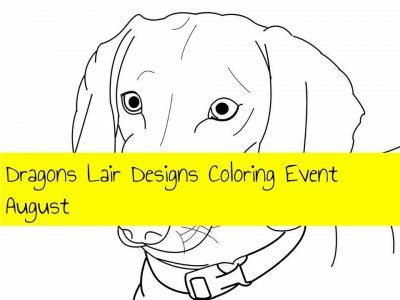 A few months ago I sat down with my brother’s eldest son and showed him how to make a pattern for some shorts to fit him using the Lutterloh Golden Rule system. 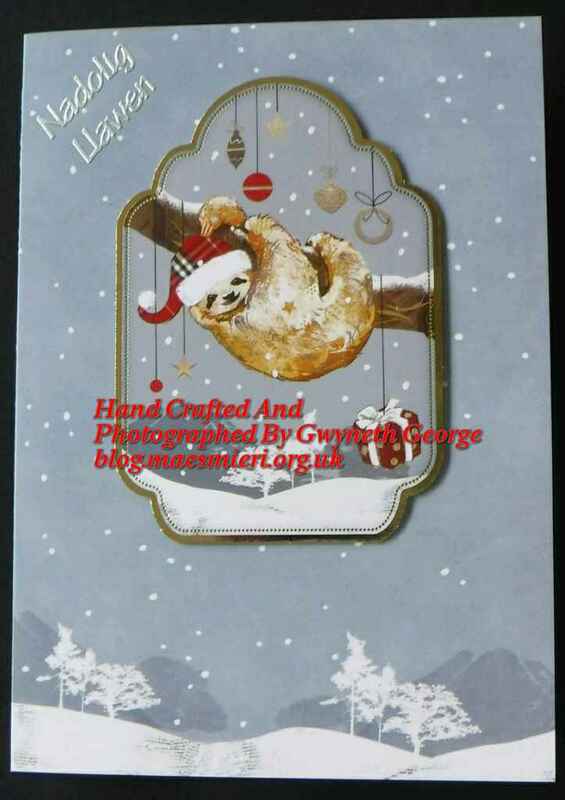 With basic guidance and a steadying hand to hold and pass him things he made quite a good job of it. 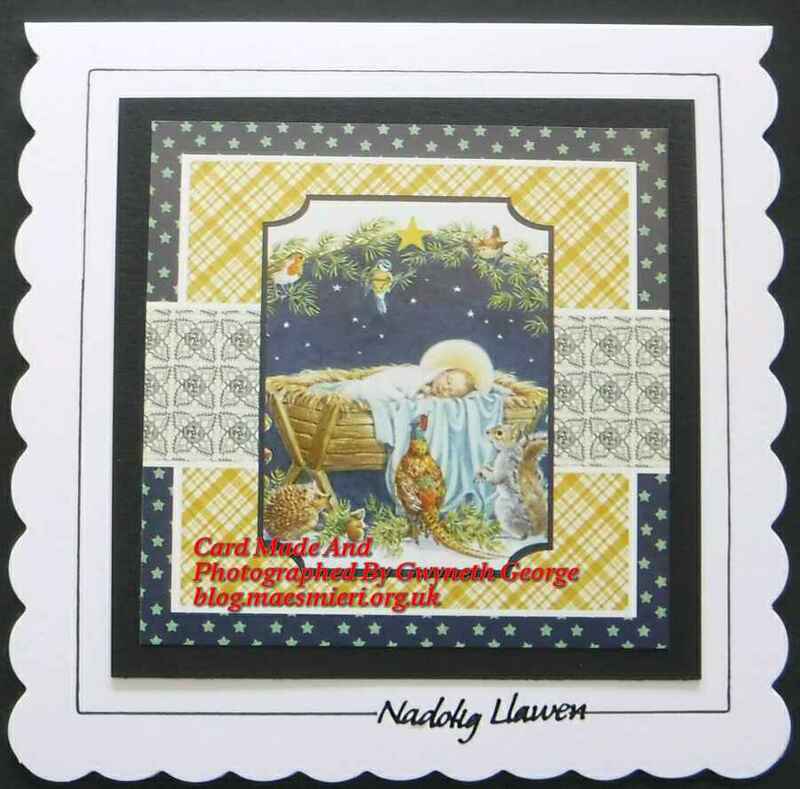 He’d chosen some black material some time previously so the pattern was immediately put to use. 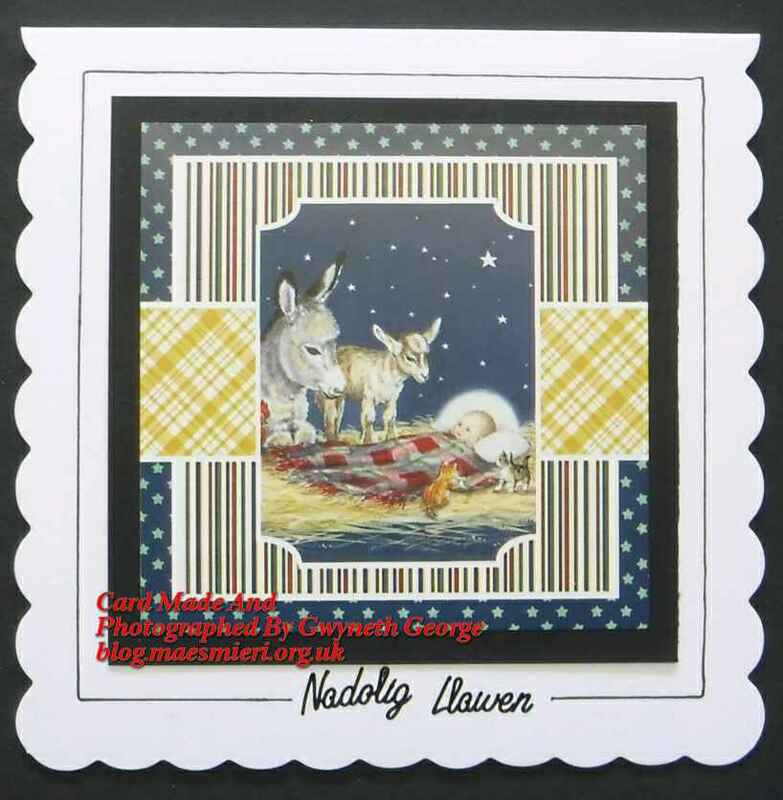 He did most of the pinning, cutting, and sewing himself as well. 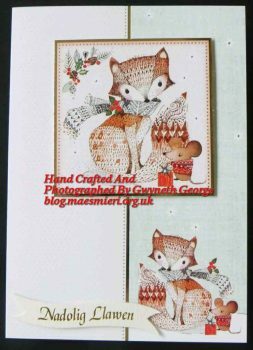 He’s been doing bits of sewing on my machine, supervised of course, since he was very small, needing the foot pedal to be placed on the same footstool the boys used in the bathroom to get onto the toilet and stand in front of the washbasin when they were small. 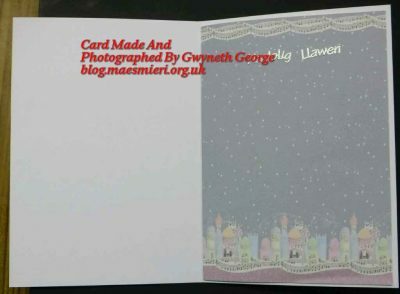 I did have to take over for doing the waistband with chanel for the elastic, the actual threading of the elastic, and sewing the hem, so he’d done the most of it before he ran out of steam. 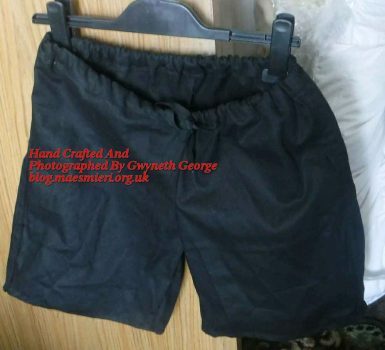 With one thing and another – schoolwork, exams, life in general – he hadn’t had time to make up any more shorts, so I decided to make both the youngest nephews a pair of shorts each this month to make sure they had something to change into when here. At the moment the boys are near enough the same size, and the shorts he’d made definately still fit the nephew who’d made it as I’d seen him wearing it the day before I decided to make up the two pairs. 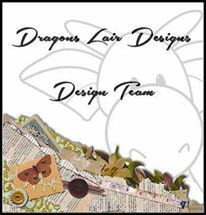 So out came the patern and material – the sewing machine and thread already being out because of the work I was doing on my “Big” Project. 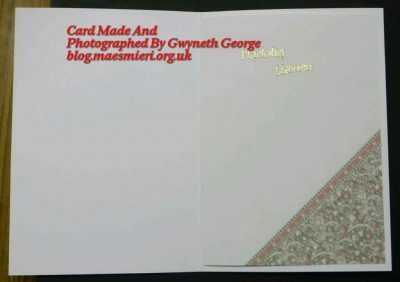 I’d seen a flat seam demonstrated on TV, similar to the side seams on jeans, so decided to give it a go for the outside leg seams. 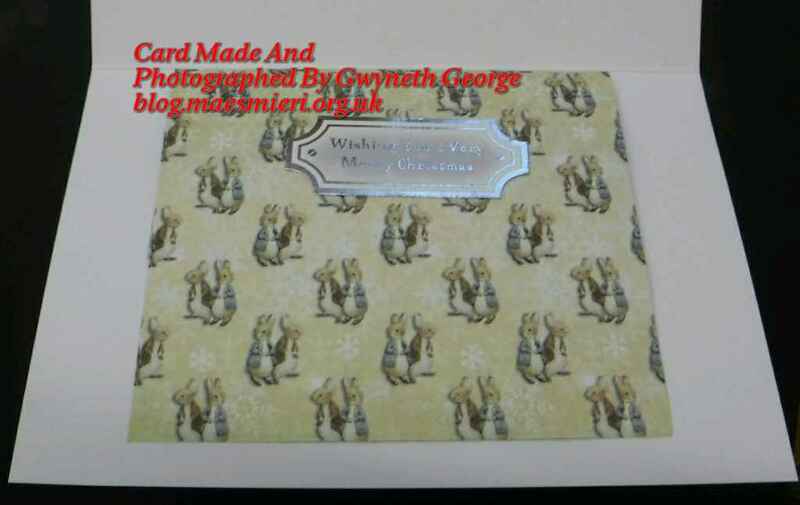 I didn’t change thread colour to stitch down the outside of the seam, but I do think the seams look neat. 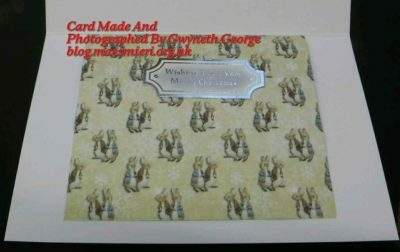 For the other seams I sewed them as normal, right sides together, and then used the machine’s equivelent to an overlocking syitch to sew over all the raw edges. For the first pair I sewed the top of the shorts over to make a chanel for threading an elastic through. For the second pair I got my nephew to measure a 1″ wide length of elastic round his waist and pin it at the correct length. 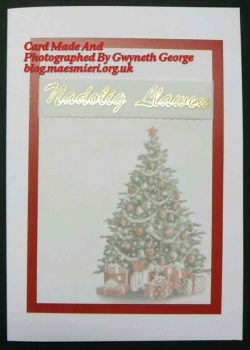 I then pinned it every 8th of the way round before sewing the elastic directly to the top of the shorts, that I’d turned down around half an inch behind the elastic to hide the raw edge, using a zig-zag stitch. 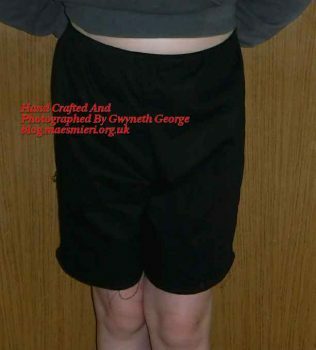 I got my nephew to try on the shorts when I’d finished. He was happy with the fit, so it was then a case of tidying up the tgread ends. 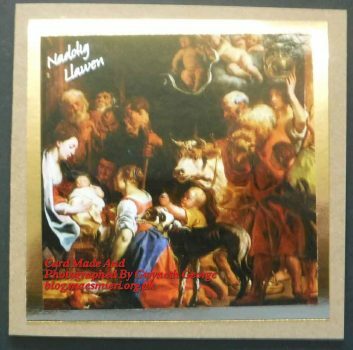 The second nephew was more difficilt to grab hold of to try his on, so I had to photograph his shorts hanging on a hanger over a door handle.